Bose will launch this summer three new PowerMatch power amplifiers, which will add to the existing PM8500 released a couple of years ago. Available in three power configurations (60, 120, and 240 W), the Plena Mixer Amplifiers combine a user interface with paging and playback performance, and are designed for restaurants, offices, warehouses, schools, retail, gas stations, and government offices. Crest Audio announces the new Nx Dante-8 NexSys control module, which works in tandem with the new Crest Audio CKd Series of power amplifiers to support Crest NexSys 5 and Peavey MediaMatrix NWare audio software programs. Crest Audio announces the CKd Series of multi-channel, networkable power amplifiers. Carver Professional released its new lineup at NAMM 2011, which featured the new Xr Series power amplifiers and a line of powered speakers. Carvin's new HD1500 amp delivers 1500W bridged at 4 ohms. Safari 3000 is Phonic's 160 Watt Mobile PA System with 3-Channel Mixer. 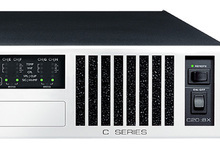 Crown Audio today introduced the ComTech DriveCore series of amplifiers. Stewart Audio introduced the AV30MX-2 and CVA50MX-1 combination mixers/amplifiers. Crest Audio debuts the E-Lite Series power amplifiers with the E-Lite 1800 & 3000 and E-Lite 1800 DSP & 3000 DSP.